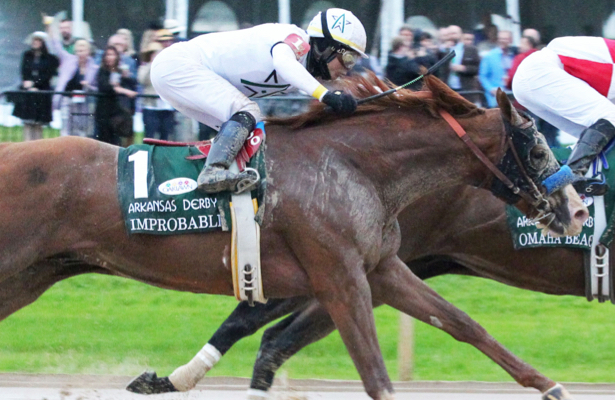 Trainer Bob Baffert said immediately following the Arkansas Derby (G1) that Improbable would be pointed for the 2019 Kentucky Derby. After finishing second in the first division of the Rebel – the City Zip colt’s first career loss – Improbable was wound up in the Arkansas Derby post parade and antsy in the starting gate, having to be backed out after initially loading into stall No. 11. He still finished a strong second to Omaha Beach, as it was 5 ¾ lengths back to third-place finisher Country House. Improbable raced in blinkers for the first time Saturday. The equipment change, Baffert said, didn’t help. Baffert, who also trains the 1-2 Santa Anita Derby (G1) finishers Roadster and Game Winner, is seeking his record-tying sixth Kentucky Derby win. "I had some anxious moments," said told Santa Anita's publicity staff of Improbable on Sunday morning, "but was pretty relieved that we ran second, got in the Derby and learned some things about the horse. “But he was fresh, because I’ve just been running him into shape. I haven’t really tightened the screws. I wanted the races to do that, and he got beat by a very good horse."